Cornetist/trumpeter Tommy Ladnier, [Thomas James], was born in Florenville, LA, 28 May 1900 and died in New York, 4 June 1939). 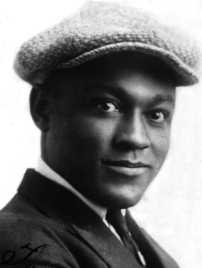 After moving to Chicago in 1917, he worked with various groups and bandleaders in the area, including Ollie Powers, Fate Marable, and King Oliver (1924â - 5), and made numerous recordings with pianist Lovie Austin, accompanying a number of blues singers. He played in Europe with Sam Wooding 1925 -1926 and in the U.S.A. with saxophonist Billy Fowler. He then became principal trumpet soloist in Fletcher Henderson's band from October 1926 to November 1927 and was one of the highest paid New York musicians at that time. With Henderson, Ladnier made a number of now classic recordings. From 1928 to 1929 he was again in Europe with Wooding, and subsequently worked with Benny Peyton and others as well as leading his own group in Paris. He was a member of Noble Sissle's band (1930 - 1931), with which he played in Europe and the USA. After several temporary engagements, he became co-leader with Sidney Bechet of the New Orleans Feetwarmers, who were active in New Jersey and New York (1932 - spring 1933). The two men briefly ran a tailor shop in New York (1933 - 1934) and Ladnier the led his own quintet in New Jersey; played and taught in Connecticut, and performed around New York State. In 1938 he recorded with Bechet and Mezz Mezzrow in a series of now famous recording sessions organized by French jazz critic Hugues Panassié. Ladnier's style in the early 1920s was mainly influenced by King Oliver, but he gradually developed a style of his own in an early swing style. Much of his work is symmetrical and songlike and he had an exceptional sense for swing, suggestive of Armstrong's early style, and he sometimes played boldly. He was adept at con­trapuntal interplay, and in his later work, eschewing the upper register of the instrument, could create a sound at the same time both spir­ited and relaxed.